My family LOVES to play cards. I grew up playing games and so did my brother and sister and all of my cousins. We always say we have the “card gene.” As children, we had to know that 4 + 8 = 12 or 9 + 5 = 14 or we’d lose the game! Memorizing addition facts was a necessity. It had nothing to do with school, it had everything to do with winning! And yes, we are a competitive family but we also had to learn how to lose gracefully. Our parents didn’t just “let” us win, no, they taught us to think for ourselves and learn new strategies. I’m telling you this because I recently read an article in the Wall Street Journal that attests to the value of family games. Games not only teach math skills but improve memory too. In order to win, you need to remember cards your opponent played and analyze what they might need. These strategic thinking skills challenges your memory for young and old alike. My 97 year old card playing sister has an amazing memory! By analyzing and remembering her opponents discards, she can tell exactly what they are saving. I’ve had to learn to lose gracefully to her! Confidence building is another benefit of playing a game of cards. Begin with easy games for toddlers, like War, Old Maid, Concentration or Go Fish. If you’ve forgotten how to play some of these games, here is a good link, Family Games. Another list of fun games for teaching addition and subtraction math facts is found at Dice and Cards to Teach Math Facts. Remember, “The family that plays together, stays together.” Interaction as a family far outweighs solitary activities. 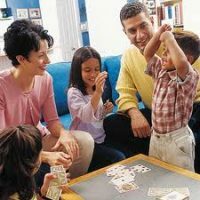 Plan a family game night once a week. Make it fun and you will be creating memories that last a lifetime!